There are no shortcuts in threat assessment and protective intelligence research, but there are tools. If you’re familiar with Psychology of Intelligence Analysis, then you know that retaining information is a critical weakness of the human mind. Whether we remember something is dependent on a number of factors, not necessarily whether it’s important to the task at hand. 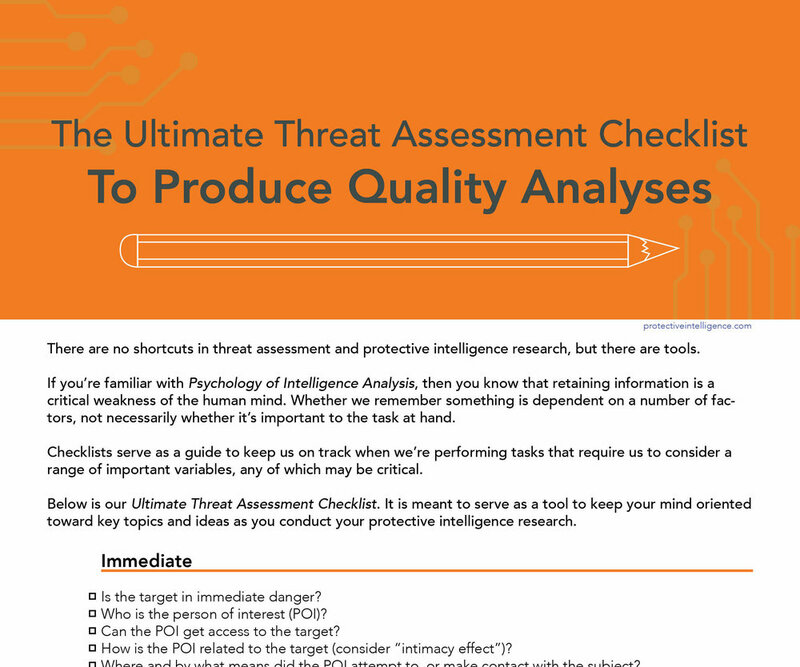 Below is our Ultimate Threat Assessment Checklist. It is meant to serve as a tool to keep your mind oriented toward key topics and ideas as you conduct your protective intelligence research. Thank you for taking the time to read and download our threat assessment checklist. This can be an especially valuable tool for the junior protective intelligence analysts in your organization. Please share it with your team and colleagues. Violence Assessment and Intervention: The practitioner's Handbook -2nd edition (2009) by Cawood, J. S., & Corcoran, M. H.
Threat Assessment and Management Strategies: Identifying the Howlers and Hunters (2009) by Calhoun, F. S., & Weston, S. W.
International Handbook of Threat Assessment (2013) by J. R. Meloy, & J. Hoffman, Ed. Protective Intelligence & Threat Assessment Investigations: A Guide for State and Local Law Enforcement Officials (1998) by Fein, R. A., & Vossekuil, B. Washington, D.C.: U.S. Department of Justice, Office of Justice Programs, National Institute of Justice. Task Force Report: Predicting Violent Behavior (2012) by DOD Defense Science Board Office of the Under Secretary of Defense for Acquisition, Technology and Logistics, Washington D.C.